Work. Does it take all your energy? Do you give and give, and all it does is take? Do you feel like it never really listens to you? Joking aside, there's plenty about employment that feels alarmingly close to marriage. It can take precedence over your friends, follow you wherever you, even keep you up at night (and not in a good way). Though in reality this is quite unsettling, we've become normalised to this way of living. We wave it off with dry humour and a comic eye-roll. 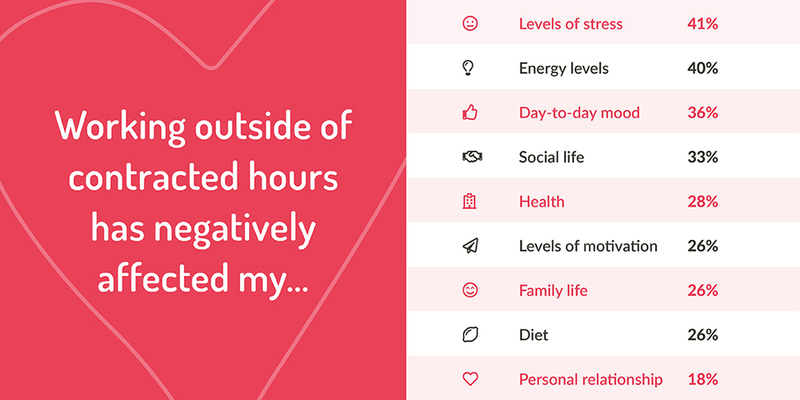 However, the perforation of work into our downtime can seriously impact our mental wellbeing, leading to elevated stress levels and, in the worst cases, burnout. It seems most employees can’t bear to be apart from their other half. Over 50% of those who answered the survey admitted to checking their emails while at home with a similar number actually corresponding with their colleagues outside work. Even in the office, keeping up with emails can be a drain on productivity but when this expectation transgresses into our personal life, ‘death by email’ sounds less dramatic and more prophetic. Earlier this year there was a rumour that France recently passed legislation banning any employee from checking their emails past 6pm. Now while it was subsequently debunked as a myth the idea does have merit. Simply because we have access at home, means that we are almost inclined to carry out regular checks – as if we are expecting a PR scandal to break at 2am. Restricting this access isn’t such a ludicrous idea either. Communication tools such as Slack have already taken the initiative in this respect, building in functions that mute conversations outside working hours. 28% of those who answered the survey felt that they were always at work even when they were at home. This won’t come us much of a surprise. We’ve all experienced that sinking sensation of reaching the end of the day, knowing you haven’t even made a dent in the workload. One of the big factors in this stat is the changing relationship people have with their work. Millenials get rough press about work-shy, however in reality they put in far more hours than older generations in order to impress their managers. An employee in their mid-twenties is likely to work an average of 7 hours overtime per week, much of this being carried out at home. The issue here is that most of the time it’s futile. Productivity, according to research done by Stanford University, nosedives after 50 hours per week. No doubt this will come as disheartening, even soul-destroying, news to finance buffs battering through 70 hour weeks but it’s hardly surprising. It seems that work is truly our number one. 24% of those who answered admitted to skipping social occasions, with a further 21% having failed to take their annual leave because of work commitments. Having an active social life is not only key to having a fulfilled and enjoyable life but also for maintaining high performance in the workplace. It’s the equivalent of being in an all-consuming relationship, where you never see your friends. Invariably, both parties end up unhappy and the relationship breaks down. The same logic applies to work, you need equal measures of work and play to stay on the top of your game. 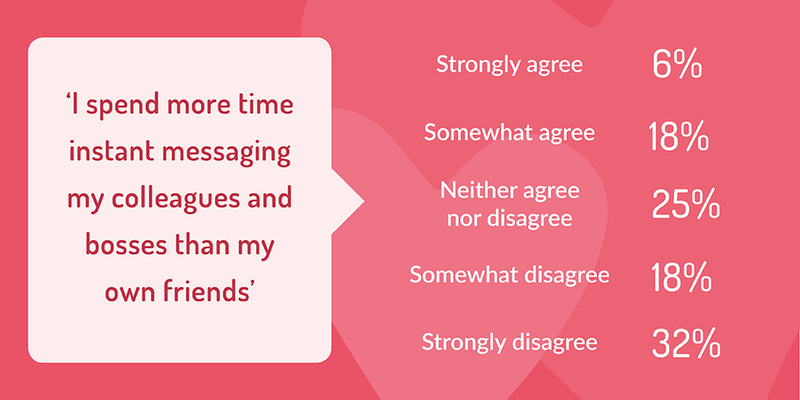 24% of people who answered believe they spend more time messaging their colleagues than their friends with a further 25% sitting on the fence. The instant-reply culture that has developed in the working world is essentially stifling our ability “switch-off” and have a personal life. Of course there’s a level of sociability that is healthy within working circles: going for drinks, or dinner with your colleagues should be encouraged but being “available” to take work requests via text, or instant messenger is not healthy. In fact it’s actively bad for our mental wellbeing. The biggest problem here is that the more we do it the worse it gets. If your manager knows you’ll look over a budget report, or call a client in the middle of the night, they’ll ask. So setting boundaries when it comes to communication is key. This is the most alarming of all our findings. Work appears to negatively impact almost every component in our mental and physical wellbeing, to varying degrees. The biggest culprits were stress and energy levels with almost half of those surveyed agreeing that work had negatively impacted these areas. This really is the conclusion the rest of the survey is leading to. And it’s not surprising. Being part of a toxic relationship gets people down and hits areas such as mood, energy, sleep and diet. The same is evidently true of unhealthy working habits. So what’s to be done? It’s time to redress to the work life balance, give people back their free time and set them free from the grips of a loveless marriage.